Over the past 24 hours, many well-recognized traders in the cryptocurrency market have expressed their optimism toward the stabilization of Bitcoin and its positive weekly moving average convergence divergence (MACD). 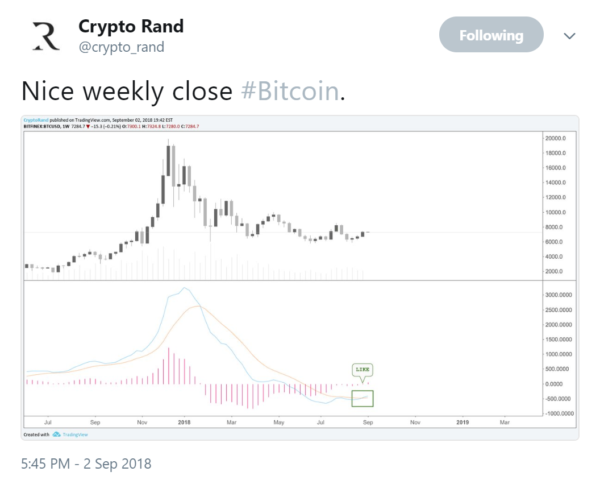 Popular cryptocurrency traders and analysts including Crypto Rand have placed heavy emphasis on the weekly MACD indicator of Bitcoin, which has demonstrated a reverse in trend for the first time since July. When the weekly MACD showed a major reversal in late July, the Bitcoin price increased from the low $6,000 region to $8,400, initiating a major rally to the upside. Where is the Next Target? Last month, Masayuki Tashiro, a prominent Japanese market analyst, said in an interview with Bitcoin.com that the price of Bitcoin will easily achieve $9,000 by the end of October. Tashiro alluded to the possible trend reversal of Bitcoin and positive regulation-related developments that have been made in Japan and South Korea. Throughout the past three months, Japan and South Korea, which remain as the second and third largest cryptocurrency exchange markets behind the US, have focused on implementing new regulatory frameworks that can facilitate the growth of their local cryptocurrency and blockchain industries. South Korea in particular has drafted a new cryptocurrency and blockchain legislation, which is expected to be passed by Congress by the end of 2018. Once passed, cryptocurrency exchanges and blockchain projects will be acknowledged as regulated financial institutions and legitimate projects in the fourth industrial revolution, with the backing of the government. “Strengthening the rules is a good move. People will be able to invest with peace in their mind as the poor quality crypto vendors will exit and a strong anti-money laundering system will be put in place internally within each exchange. Furthermore, last year BTC price rose by more than 40% twice. this is the same figure as the Nikkei average during the Lehman shock,” said Tashiro. Given the previous movements of Bitcoin throughout this year, Tashiro reaffirmed his $9,000 target by the end of October. The reversal in the weekly MACD indicator of Bitcoin can be considered as a stepping stone towards a potential mid-term rally that may continue throughout September and October. But, it is important for the market to move by small margins in a consistent manner to avoid an abrupt decline in value that may drastically change the trend. So far, with Bitcoin demonstrating stability in a low price range, a mid-term rally is highly likely and since July, the market has performed similar to the expectation of Tashiro. If the MACD reversal can be sustained and the volume of the market can be maintained, Bitcoin will be able to test major resistance levels at $7,500 and potentially, $8,000. The post Trader: Bitcoin Break Out Imminent as Weekly Chart Turns Bullish, $8,000 Next? appeared first on NewsBTC.